The loss of a child or of someone with whom you are deeply bonded can be a painful experience and over time very isolating. As others close to you “move on” with their lives and go back to their normal routine, we struggle daily just to carry on! To add insult to injury many folks seem to be impatient and place an unspoken time-limit on our mourning! Others actions seem to shout “Time to move on!” and “When are you going to be like your old self again?” Sometimes these are even the phrases we scream to ourselves! We lack patience and understanding not just from others but from ourselves as well! Without the much needed empathy we are left feeling even more lost and alone. Perhaps we can attempt to in some way communicate the loss of our child or loved one in a way that will be more understandable to those who cannot or are unable to imagine what suffering such a loss might be like. Some of us have a hard time “going there” due to our own fears, anxieties or issues… and yet for some of us it is hard to truly BE THERE for those who suffer such pain because we simply cannot wrap our mind around such loss to understand what it might be like… and how to most lovingly respond. 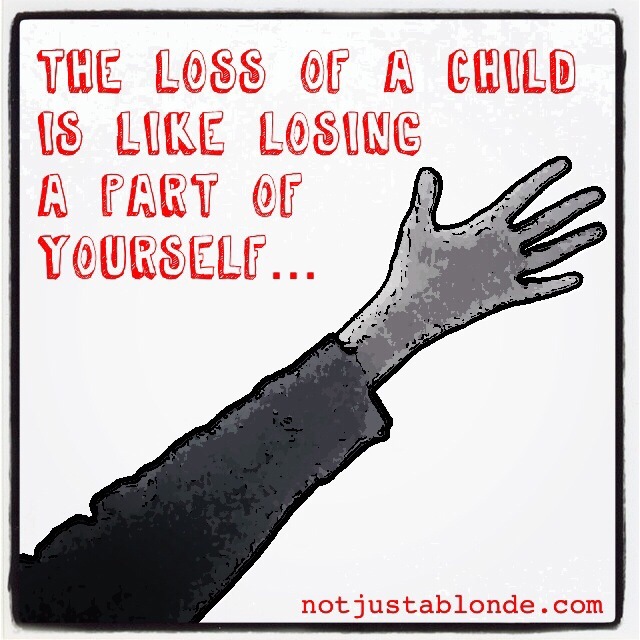 The death of a child is like losing your hand. If you cut off your hand could you continue to live? Yes. Yet, you would be forever changed. Your “old ways” of doing things and interacting with your environment would no longer be possible. Your daily activities would never be accomplished the same ways again. Not because you don’t WANT to go back and do those things again, but because you CAN’T. Your hand is gone. You are not the same. A piece of you is missing. You are forever changed. Your value as a person, a wife, a mother, a worker, a friend has NOT changed. No, you cannot produce or perform at the same level as before, at least not for awhile, until you learn new ways… but you are still you. You are still human. You continue to live, and function and feel… despite the pain. Speaking of pain: it does not go away simply because a few weeks, months or even years have past. Where your hand once was attached there are nerves that have been severed. The nerves are raw and angry. The injury is real. You feel the pain caused by the loss of your appendage and the damage to those nerves. The hand is gone, but the pain left by it’s loss remains. Time will lessen the pain, but it will likely never go completely away. Your hand was a part of you. You were attached. When you visualize yourself, your hand was a part of your self-image. It was a part of who you were. You shared memories and a history of doing meaningful things together! It was a part of how you interacted in this world and lived your life. It is how you did those things that make you… you. Now your hand is gone. You will carry on in time, but you are forever changed. No one will tell you to “Get over it” as once lost, a hand does not simply “grow back”. It is understandable you would not behave or function in the same way as you did before your loss. It is obvious to all who see you that your loss is significant, life-altering and real. Others applaud you for all you DO now accomplish despite this obvious loss. You should be proud of all you are able to do as well with the loss of your hand. Now replace the loss of a hand in this story to the loss of a child. May all who read this begin to understand that those who lose a child have lost a part of themselves. The loss is not a physical part of them but a spiritual part… and completely REAL. Those who experience such loss will never function the same, nor should we ever expect such! If someone you know and love survives the loss of a child (or if that person is you) encourage them for all their new accomplishments no matter how small, because for them it is like learning how to live again. Their pain is real. Their loss is real. And they will never be the same again… because their love is real as well. How does it feels to lose a child? Cut off your hand and you may begin to understand. This post is dedicated to all mothers who have experienced the agony of child loss. This essay was specifically inspired by the passing of my dear Aunt Donna’s son Alex and the passing of my soul nieces Annemarie and Vivian. Although I have not experienced child loss directly I am grateful and honored that I have been allowed on the journey of mourning with their mothers who I love so very very much! I like your comparison with losing a hand. Very effective. Also, I would say that everyone goes through the stages of grief at their own pace, and no one has the right to tell them it is either too slow or too fast. Offering support, as you stated, is very helpful; pushing them is not. Thank you. I am the Aunt Donna if this blog. My son has now been dead for two years. I am beginning to adapt to the loss if my “hand”, my son Alex. He was 26 one month and one day old when he was killed. Ann, we men can never know the depth of the relationship between a mother and her child, even if we are the father of that child. The relationship is both emotional and physical: it is a tie of blood. A good friend of mine called Patsy (I can use her true name, because her experience is already in the public domain, lost one of her sons in a shooting. He borrowed 50p (less than a dollar) from her, to go out and play basketball one evening, and never returned. On the way he stopped and spoke to some friends of his, and while he did so, he was shot dead, the victim of mistaken identity in a gang- related/drug related revenge killing. Patsy was heartbroken, even though God had warned her that he was going to die soon, but through her determination and her faith, she founded an organisation known as Mothers Against Violence, to try to combat gang culture, primarily in Manchester, but with links nationwide. What she discovered was that the gang culture had its basis in the absence of the father (which robbed boys of the example of a gentle male role model) and some sense that nobody cared about them, or loved them, so they found their family in the gang. The killer of Dorien Junior, Patsy’s son, has never been detected, but she goes into schools and prisons to talk to young men, who are already, or who may become, involved in gang-related crime, to speak to them and to try to persuade them to make the step to come away from their gang. She cannot forget, but she forgives, as God knew she would when He let her son be killed. We cannot know how many young men there are who are still alive because of Patsy’s action, and how many mothers have been prevented from feeling the pain that she has felt, however, we can be certain that there are many, as gang-related crime in Manchester has fallen considerably since Patsy’s response to Dorien’s death began. It’s taken me a long time to realize that I don’t have to “fix” everyone’s problems. Though I’d like to be able to take away the pain someone I care about is dealing with, I am limited. As hard as it is for me to just “be there” I have come to accept that just doing that is a lot, not finding the right words, which may sound wrong anyway. I am Alex’s mother. Sometimes just being there is all we need. A reply to my own post! The ‘quotation’ from the Bible is not correct. It came as it was because God required it to be that way for whoever is to receive it. The correct version is from Isaiah 54:1: ‘Sing, O barren woman, you who never bore a child; burst into song, shout for joy, you who were never in labor; because more are the children of the desolate woman than of her who has a husband.